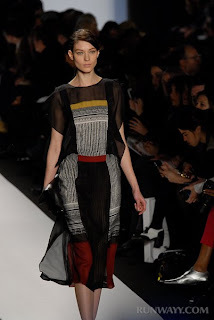 For BCBGMAXAZRIA Fall 2012, shape and color play a part in elongated proportions, while form and function create a geometric abstraction of Bauhaus style. Lightweight silks, chiffons and crepe de chine are paired with woolen and luxe outerwear. The palette includes camel, cream, taupe, blush, merlot, coral, paprika, macchiato, olive, green ochre, cognac, navy, rust, teal, black and white. 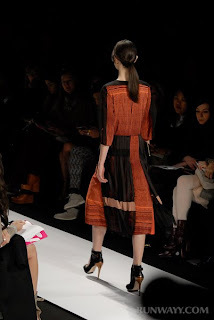 Favorite looks include jumpsuits, pleated, printed colorblock dresses, georgette blouse and pleated skirt with sheer tulle skirt, georgette V-neck blouse with scarf detail and silk wide leg trouser and wool/leather cropped jacket with georgette shift dress. Suede ankle strap shoes, suede booties, stamped croco, leather buckle and foldover clutches and leather shoulder bags are featured fall accessories.